Ama Dablam is a mountain in the Himalaya range of eastern Nepal . The main peak is 6,812 metres (22,349 feet), the lower western peak is 5,563 metres (18,251 ft). Ama Dablam means "Mother and Pearl Necklace" (the perennial hanging glacier is thought of as the pearl). For several days, Ama Dablam will dominate the eastern sky for anyone trekking to Mount Everest . Ama Dablam was first climbed in 1961 by Mike Gill, Barry Bishop, Mike Ward and Wally Romanes. The normal climbing route is via the southwest ridge (right skyline in the photo). Climbers will typically set up three camps along the ridge with camp 3 just below and to the right of the hanging glacier (Dablam). Any ice that calves off the glacier typically goes left, away from the camp. However, a 2006 avalanche (see below) proved otherwise. A climbing permit and a liaison officer are required when attempting Ama Dablam. As with Mt. Everest , the best climbing months are April-May (before the monsoon) and September-October. Mt. Ama Dablam (22, 501 feet/6812 meters) is one of the most challenging mountains among the other mountains not only inside the Nepal but also in the world. 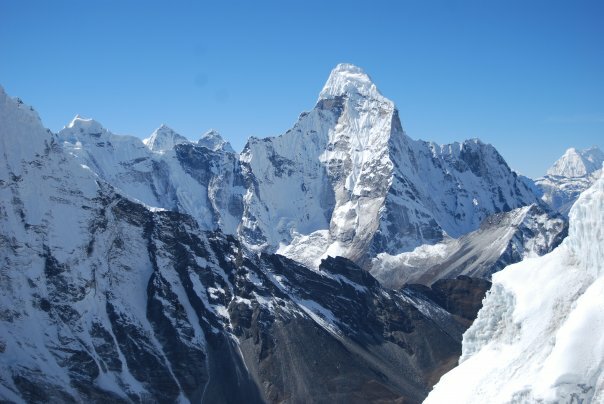 The normal route to climb Ama Dablam is from its South- West ridge. Ama Dablam is a small snowcapped peak lying in the Everest region. This South – West ridge is the normal and most popular route in order to ascend the Mt. Ama Dablam. In addition, an expedition to Ama Dablam is more than just a climb. It's a journey into the heart of the Himalayas . Located in the Khumbu valley of Nepal , only 12 km from the summit of Mount Everest , Ama Dablam demands the attention of every passer-by. Soaring ridgelines and super-steep faces guard the summit from all but the experienced climber. From the summit you are surrounded by a vista of peaks like no other, five of the highest six peaks in the world are clearly visible. The first ascent (via the SW ridge) of Ama Dablam was not made until the mid 60's by a strong NZ/USA team. The north ridge fell to a talented French team as late as 1979. In recent years many parties have successfully climbed the mountain, with nearly all ascents via the original SW ridge route. HIMALAYAN NIRVANA TREKKING proposes the SW ridge for the purpose of this Expeditions. Our ascent will be made via the conventional SW ridge route, a technical route that requires 3500m of fixed ropes and four camps above base camp. The climb can often be completed easily in less than four weeks; however we do build in an extra week in case of exceptionally bad weather. The climbing on the route involves pure rock climbing on exquisite granite followed by mixed snow and rock climbing. The last section to the summit involves ice climbing followed by a long steep snow slope: often ropes are employed all the way to the summit. The reasons for this are three-fold: safety, speed and success. Due to the technical nature of the route, ropes will be fixed for most of the climb above camp one. Although we can brush-up your skills at base camp, a good working knowledge of abseiling and use of mechanical ascenders (jumars) is mandatory: prior experience is required. This might involve a couple of weekend sessions at your local cliff or bridge. Objective danger on the SW Ridge route is minimal, ice cliffs do not threaten it, the snow slopes are generally stable (with minimal avalanche risk), the rock is of good quality and the mountain is below the reach of jet stream winds. The route is extremely exposed and mistakes with rope work can be unforgiving. For this reason we recommend you to have an experienced guide to keep you safely on track. & strong local climbing Sherpa team to help us on the mountain. The Sherpas are the key to success. They carry and assemble our tents, fix much of the rope and supply each camp with food, stoves and gas cylinders. Without the aid of Sherpas the chances of success are diminished and all your hard work can be wasted. Often the Sherpas are able to stock camps with sleeping bags as well! This then allows each climber to focus on getting up the hill. Your guide will be involved in the fixing of rope and the smooth running of the expedition but their primary concerns are client safety, service and success. Your guide will be climbing with you at all times, often assisted by a climbing Sherpa. Your guide and Sherpa will ensure your safety and make decisions regarding safety and weather. Your guides perform cooking and other camp duties. This allows you to rest and enjoy your surroundings at each of the camps. You are then left to carry only your personal gear between camps. DAY 06: REST DAY in Namche Bazaar. DAY 07: TREK TO THYANGBOCHE 3,863m. DAY 09: TO 24 ASCENT OF MT. AMA DABLAM. DAY 25 : TO 27 RETREAT TREK TO LUKLA. DAY 28 : RETURN FLIGHT TO KATHMANDU . Everest or Alpine model would be best. Peak permit and all govt. taxes. 4 nights hotel in Kathmandu on twin sharing BB basis. Domestic airfares and airport tax. Custom clearance, domestic cargo and excess baggage. Cook (s) and necessary kitchen staff. Required number of porter and yaks with herder. High Altitude Climbing Sherpa 1:2 (01 Sherpa per two clients). All necessary climbing hardware gears. All necessary camping and kitchen gears for both trek and climb. All meals and available high altitude food for above BC. High Altitude VE-25 North Face tents. Oxygen with regulator set for medical purpose only. Gammov bag for medical propose. Walkie-talkie set with radio base. Sleeping bag & down jacket on request. All airport/hotel transfers by private van.